Arioch DID mention that loroi!Chess would make an appearance soon. Soldiers are all soldiers, and pilots are all pilots. Talon and Spiral aren't thinking of Alex as a strategic resource or a science project like Tempo and Beryl are. Alex is probably relieved to talk to an alien that isn't trying to bully him, interrogate him or just plain milk him for information for the last month. To them, just talking about star charts, drinking caffeine and shooting the breeze sounds like a good time. Preferably away from those diplomatic types and the senior officers. And now you mention it, have you ever heard of a game called "cards"...? That thought crossed my mind too. Especially since Alex felt the need to set things right with his actual rank rather than the one which simply defaulted to him because he had been the sole survivor of this ship and its mission. I think chess and something like that would be what Beryl herself might suggest. Or Tempo. To gauge his mental capabilities, strategic thinking and his approach to difficult situations. With Talon, she or rather Alex himself would come up with an easygoing game of chance. Alex: "Name of the game is five card stud." Talon: "I am sorry, I seem not to understand. What would have males to do with this particular game? Or is your gender an essential part of it?" Speaking of watching Star Trek, one of the things that always impressed me when I was little, was the dramatic lighting they used in some of their movies. I get the feeling Alex has the brains for Loroichess, the question though is how fast he'll pick it up. First game upset, or a few weeks of waiting in his cell? Well that's just screaming for a strip poker joke. Of course he has. First, everyone on the crew is trained and authorized to initate First Contact to an extent... though having an Ensign do it would need extreme circumstances which they actually are... and Earth would definitely want to send its finest. So I was bored... "just one more turn"
He should definitely be wary of any 1 on 1 challenges. Alex: "Okay, I'm putting a ban on spectators watching from my side of the table when we play." Tempo: "Only if we play without a table that obstructs the view next time. Now did you have any garments left or...?" Talon: "Nothing in that absurd orange." Beryl: "There is the other sock, and then only the last piece, and then..."
Alex: "I can locate what I'm wearing without everyone's help, thanks!" The use of telepathy does bring up an important notion that I hadn't really considered, with regards to Loroichess. If the Loroi are accustomed to using their telepathy to pick up hints from their opponent, his resistance to that might give him an edge even as a beginner. Interesting point. Same would go for poker. What would be the point in bluffing if the other players could read the own intentions? Hmmm. Could it be that such games act as a training to hide from each other, too? Loroi have their own internal rivalries and conflict, too, so even if it's frowned upon in polite society, they would see the merits of such an ability. Just don't tell them about Monopoly. No need to give them any more reasons to scourge Humanity from existence. Never ever let loroi play the bank. So... spiders? Lovercraftian reveal regarding the nav data? She remembered she left the oven on? Just looks like a discussion on maps. 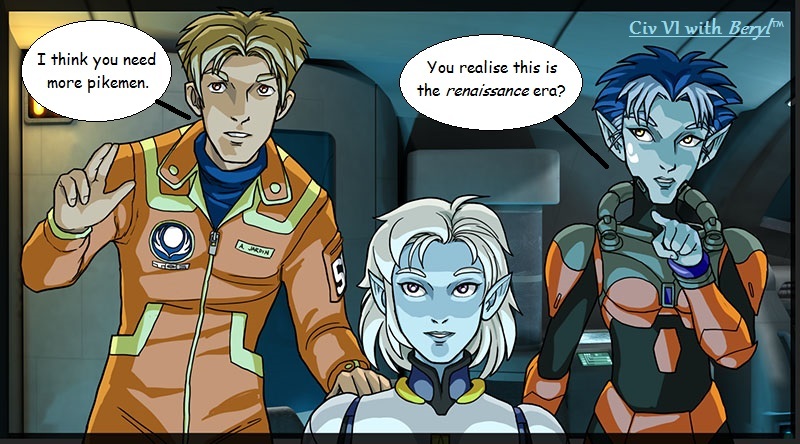 Beryl and Talon could be realising that Bellermines route is illogical for a lone ship on a contact mission but make perfect sense if there are more ships out there. And that they are likely up to meet Umiak somewhere too. And that thus a certain amount of hurry is in order. And they might discuss the implications of a possibly guiding power, who led the humans to these likely systems, despite having neither contact with Loroi or Umiak, and the Orgus being from the other side of the Umiak, and allegedly only refugees. How did anyone know and was able to advice humanity that "contact" would be likely in these systems? Could be that Talon is letting on that making real contact will be a long term goal with the current state of things, since the human systems are so out of the way and behind the tech curve as to be a one-way trip for most current long range vessels the Loroi have. Beryl is definitely looking worried, as though Alex's reaction is far from happy. He probably mentioned working more with Tempo, and all Beryl's hopes of getting close and hitting the information mother-lode are slipping through her fingers. Beryl kind of looks like an inept PC user who is shocked and surprised when a pop up appears. Leaned back, concerned look, hands hold high so as to say: "It wasn't me!" Assuming she is still sitting down, then it makes sense that Talon, the trained pilot then takes over the interface and thus leans forward. My guess is: they're interrupted by an unexpected communication from another vessel, with some equally unexpected news. Might be a good time to introduce the captain of the ship they're flying towards. Another possibility might be that Alex is filling them in on the updated star charts that the Orgus provided, with regards to how far the Umiak are expanding. As clever and tricky as it would be for the Orgus refugees to actually be Umiak agents, I'm not sure it makes sense. Surely if the Umiak knew about the existence of Humanity, they'd just send their own fleet and be done with it. I'm not sure they could have reliably pushed the fledgling space civilization to such extremely specific ends, I mean for all they know, humans might have done any or all of the varying plans that people have suggested here. Instead of sending out scouts, they might have evacuated, or sent out dragons teeth ships. The simplest explanation would be the realization that it's a race, or that Humans are pretty much sitting right on top of the new planed front of the Umiak. I do wonder why Ashrain has her own entry on the cast page. What are the chances that she somehow ends up ferrying Alex around? I'm not sure how to estimate the chances. I'd say Ashrain is more likely than Moonglow or Arclight, but my money* is on Opal. *Disclaimer: 'money' is denominated in 'internet bucks' and cannot be exchanged for goods or services.